The blue is a dark smoky blue - like that of a blue cat. "I don't know what I would have done without you! Winkie was such a gift and Sophie and Punkin are just the sweetest girls. 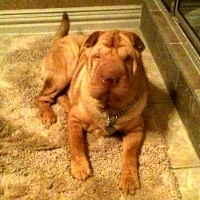 It's great knowing I will always have such wonderful Shar Pei babies."